"I can't tell you how enjoyable my trips are knowing that Sadie Marie is well cared for by you. Thanks for having such a great Doggy Daycare that we both love! I can't tell you how much I love your postcards as well - they are kept in a special album for me to enjoy. ...Sadie & I are looking forward to many more happy days at "Lucky Puppy"
This is a song I sing to Sadie when we are getting ready to come & visit you. She goes wild - jumping at the door until I open it & she gets in the car. Set to the tune of "Tra-la-la-boom-dee-ay"
"To the Lucky Puppy staff, Thanks for taking such good care of Emma during our vacation. we can tell she had a blast!! She will come back to see you soon. " Since she has returned home, we have seen a marked improvement in her doggy etiquitte - the way she approaches and plays with other dogs, and we have you to thank for that. We love the picture postcards we received and Cass will be back next time we go out of town." They have acres of fenced in land and a great swimming pool (just to mention a few of the amenities). She is exhausted when we pick her up. LOL! She has such a great time! Lucky Puppy came highly recommended to us by friends. We are so happy with all of our experiences with Lucky Puppy that we know you would be too. That is why I just had to sit down and write this review! Thanks Brenda and staff!" 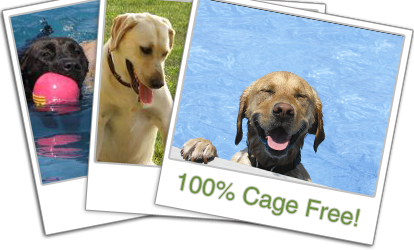 Lucky Puppy is proud to say we are 100% cage free! What Does this mean to you and your lucky puppy? Unlike most daycares and overnight facilities your loved one will never see the inside of a cage while they stay with us. What you see in our photo gallery is what you get; wide open spaces for all of our furry friends to play in. Our guests don't seem to mind that the cages are missing at all! Our 3 acre playground is fully supervised by "Pack Leaders" during playground hours. Our Pack Leaders are extensively trained in canine body language and behavior, as well as pet first aid to ensure your furry family member has as much happy, healthy, and safe fun as possible. This is where our guests spend most of their fun-filled day. In our photo gallery you can see some of our favorite pictures taken in our new 20X40 in-ground bone-shaped pool. Is your loved one too small for the deep end? Don't worry, our new pool has an 8' tanning shelf for those a little less adventurous. Daycare is included in the vacation cost. Your loved ones will be on the playground from 9am to 5pm. When the playground closes, they come in the house and become part of the family. They do not go to bed until we go to bed, and that is when when we separate them according to size and temperament. Some may sleep in the living room, some may sleep on the office futon, and others may have their own room in our doggy village complete with a crib sized youth bed, calming CD music, fluffy pillows, blankets, and toys for everyone to be as comfortable as possible! When they're not too busy playing with all of their new friends, we take them out on our nature trails. As you see in our photo gallery, the 7 acres of Nature Trails gives us a beautiful place to enjoy a walk or run with your dog. The Nature Trails have been completed with an additional fully-fenced, 3 acre playground, which includes a wooded area; a pond; and tall grasses in which to explore. Our 1300 sq' indoor playground is open! The kids will still primarily play outdoors, however, we now have a nice cozy indoor facility to play - and train - in during extreme weather conditions. *Full service dog wash for $24. This service is offered for clients only. Your dog must be a Lucky Puppy to use the bathing facilities. Lucky Puppy has taken the Off-Leash Play Pet Center Safety Pledge! We proudly commit that our dog daycare program has been designed for the safety of all dogs. In taking the pledge we strive to ensure the physical safety of each dog and our goal is for every dog to go home from our center behaviorally and emotionally better than when they arrived.